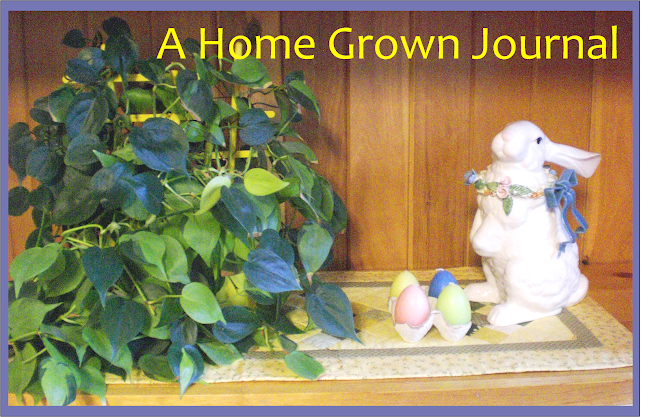 A Home Grown Journal: Is February Still A Winter Month For You? Is February Still A Winter Month For You? It definitely is for most of us living in the upper part of our nation. And certainly much of Canada, too. We have plenty of winter weather left all the way through March and (yikes!) even some years well into April. It's also the month with the holiday of Valentine's Day in it which, sorry to say, has become so overly commercialized. This year perhaps we should celebrate the day by telling the people in our lives whom we love that we do! Does anyone ever get tired of hearing those words spoken aloud? For other friends and acquaintances, take the time to tell them how appreciated they are and how much you enjoy having them in your life. Instead why not make a pan of fudge to share? I'll make my annual batch of pink frosted, heart-shaped sugar cookies. Or how about having friends over for an old-fashioned home cooked meal? Those of us still firmly entrenched in winter time desire food that will sustain us through a few more snowfalls and temperatures stuck near the bottom of the thermometer. Speaking food, I've read in several places that cabbage is "the vegetable of the month." Knock on wood, ours are still holding their own in our root cellar. From cooked, buttered cabbage to flavorful coleslaw, we like it. Oh, if only I had gotten and saved my mom's recipe for Pigs in a Blanket. Gosh, those were always so good! Another little tidbit I picked up when reading about the month of February, the first Friday of the month is . . . are you ready for this? National Bubble Gum Day. And the first Friday of the month happens to be today! Sadness and woe, here I sit without a single piece of bubble gum in the house. I wonder how long it's actually been since I had any bubble gum? How 'bout you? Mild here but in the teens at night next week, winters back! I will send a photo of my gate. Which morphed into Valentines from leftover Christmas. Some days it pays to be behind. I like your version of Valentine's. For winter, well, February and January are usually our two coldest months, but there's no guarantee on that. March is cold because of the wind, and April can introduce the 80s! Not much spring with that weather schedule. Question: My potatoes are growing eyes already. Should I pick them all off at once or is there any point to that? And being such a bore, we don't have Valentine's Day, we have a day dedicated to friendship. Oh Yes! February is still a Winter Month, in my neck of the woods! And a long one, too. Used to think....When people were talking of all the Christmas Holiday Parties, they had to go to.....Why don't some of those party people, put off their "shin-digs" till Feb.? When others might really like a reason, to party-hardy? Instead of packing them all, into the quite short Christmas Holiday Season? But here, we never had lots of such to go to. Thankfully! I certainly agree with all your Valentine's Day suggestions! It's high time, for us to not give in to all the buy-buy-buy, which goes with every holiday! Simple and heart felt is best. Especially for Valentine's Day. I have to get a Valentine Look going, on my blog look!!! Nancy - We're expecting snow this week (starting tonight! ), too. Haven't had any for a while. Susan - Well, I did suggest making a pan of fudge . . . and you could call it a Valentine's gift for yourself! Jenn - It's the perfect day to guiltlessly (?) indulge in some chocolate, if one were a chocolate lover! Goatldi - Would love to see that picture! Nature can do some strange (and silly) things! Leigh - Curious to hear you often times don't get much of a spring. We don't either. One day it's winter . . . and the next it's summer! J.L. Murphey - Sharing. Yes, that's a good word to put to Valentine's Day. Sharing and showing caring. I'll be looking forward to see what you have to say about cabbage! Rain - Knowing you, you'll make your tacos in the shape of hearts! Ooof, not good to hear your taters are starting to sprout eyes already. They are still okay to eat, but whether you pop the eyes off or not, they will just sprout more. You might want to think about canning them . . . or dehydrating some. Sounds as though the spot you stored them in might have been a little too warm? Darn. Ulvmor - As many have said, our Valentine's Day is more about making people spend money than anything else these days. I like the idea of your "friendship" day. wisps of words - Yes! To having "holiday" parties in late January or February! Matter of fact, our neighbors just went to a Christmas party put on by her place of employment last weekend. I'm betting a lot of people would enjoy that more than during the rushed holidays when there is so much food, food, food around anyway. Staying away from chocolate is well worth it for your health, my friend! Potatoes...well, I think I'll be canning the rest of them tomorrow. I'm glad I asked you! It's funny, I stored them in the basement in an unheated room, and you know how cold it gets here in the mountains, I was surprised at how that room never got too cold, now I know they need a cooler room/cellar. It's funny because the one room I choose to store my taters seems to be the best insulated one in the house! Rain - Growing a garden, harvesting its bounty, storing some of it . . . it's always a challenge. The perplexing thing is that what works one year, might not the next! Just the fact that you still have potatoes means you were a huge success at growing them this year. Think how many you've already eaten and now you'll be able to salvage the rest of them (those sprouting little devils!) by canning them. It's a win-win situation! I'm not a romantic at all...that could be why I'm alone! LOL! I do like to make Linzer cookies that are heart shaped with the cutout heart on the top cookie with raspberry jam in between. I have taken cookies to lots of people over the years but for some reason I never get a thank you so I don't bother anymore. I make them for my Valentine....Me! LOL! I used to send to the grands but too many times they ended up with a box of crumbs. I do think we should show our appreciation to people as much as possible especially those that don't get it very often if ever. I am itching to make sauerkraut but it will be store bought cabbage. Spring is here in the Ozark's already.....58 yesterday, 66 today...it is early for here too. Daffodils are up about 3 inches and I smelled a skunk yesterday morning....sure sign! Happy Irish Spring...remember that soap? Can hardly imagine your temperatures right now. Definitely not happening here yet. We've got snow coming down and temps in the single digits this morning. Hey, I didn't think it was supposed to snow in this kind of temperature!